Added the Necromancers Journal to make the BleakFalls part of this mod lore friendly and give it a little back story. Easy mode had a couple of extra creatures removed. 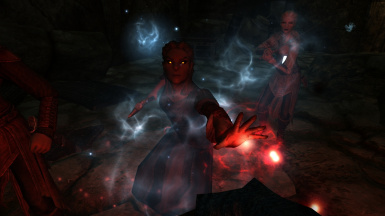 Replaces the Draugr in some of their crypts with a variety of soon-to-be lore-friendly creatures. 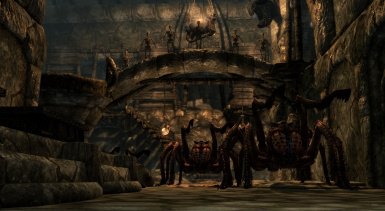 Each dungeon will have a creature-type "theme" so that giving it a backstory will make more sense ITF. Bringing at least one (essential) follower with you. This mod makes gameplay much harder. The normal version will require a dungeon raid-esque mindest to play through successfully. That means LOTS of preparing before you ever step foot in the dungeon and coming with multiple followers who've also been prepped. That is, stocking up on potions, getting a good set of armor and a good weapon, maybe grinding a little to level up your skills, making sure all of your followers are set to essential, and just generally doing anything else you can think of to prepare yourself. And even then, the "Easy" version is still pretty hard, and you'd be smart to do just a little prepping with it(maybe just stocking up on potions), too. 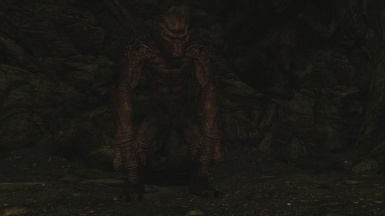 Creatures from Dragonborn and Dawnguard (with lore-friendly explanations for why they are there if neccessary). Because Skyrim deserves a few Werebears, at least. Enemy patrols to give the dungeons more life (and challenge). Download this mod and play with it. Report any bugs/glitches you find to me. Senior modders who would like to help out with the development with this mod should PM me. Really though guys, this is my very first mod, and I need all the help I can get. Got a suggestion? Don't be afraid to put it in the comments!